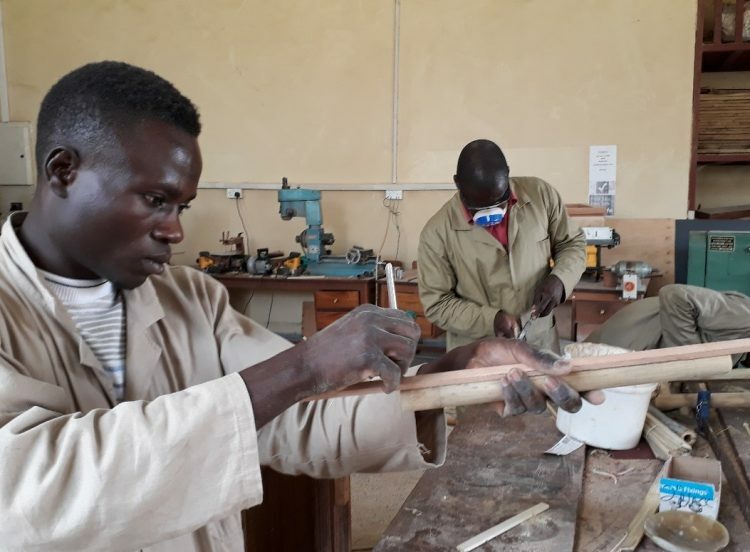 Capacity building for Ugandan trainers on construction and furniture upgrades the bamboo value chain as part of INBAR’s regional offices on-the ground work under the Dutch-Sino East Africa Bamboo Development Programme, contributing to South-South cooperation and poverty reduction. 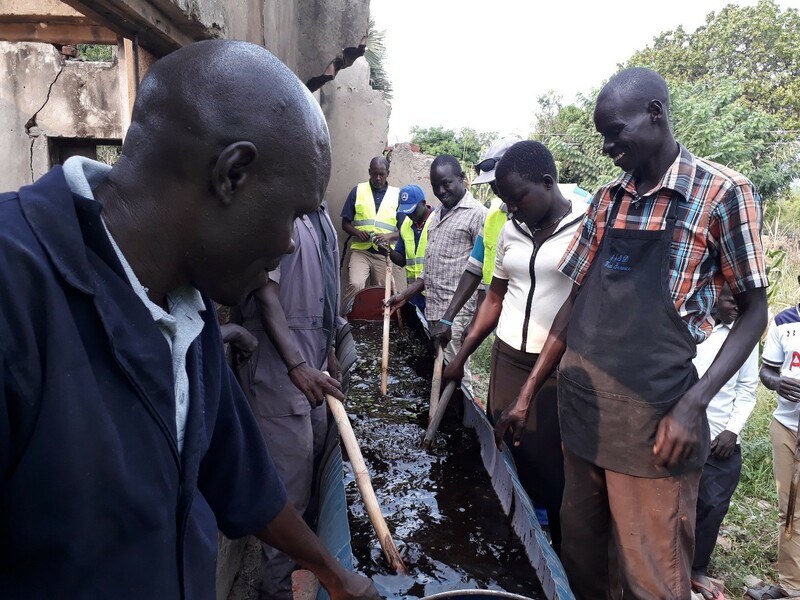 INBAR’s efforts to facilitate capacity building and South-South cooperation in Africa have paid huge dividends in the past, and recent workshops on both construction and furniture building in Uganda are no exception. In Uganda, Bamboo is a key indigenous plant resource, with two indigenous bamboo species growing in the country: Yushania alpina (highland bamboo) are mainly found in South-western (Kabale, Kisoro), Mt. Rwenzori and Mount Elgon; and Oxytenanthera abyssinica are found in Moyo, Arua, and northern parts of Uganda. A large number of rural communities in Uganda (estimated at over 1 million people) use bamboo in their daily lives, whether for the local culinary delicacy of ‘malewa’, agriculture or household utility products, or support structures for crops. Though widely used by communities, bamboo products fabricated in Uganda are mostly traditional in nature, with little value-added and an undeveloped market for high quality products. However, communities located in the bamboo-growing regions of Uganda (south western, West Nile and Eastern highlands) extensively use bamboo in the construction of rural households – usually in the form of a support frame for thatched roofs. 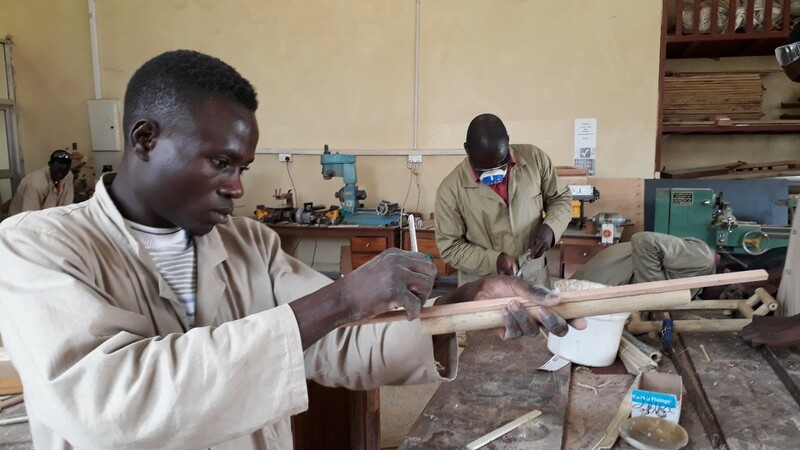 Under the Dutch-Sino East Africa Bamboo Development Programme, based on analysis of the bamboo market and value chain, bamboo in housing construction and in furniture and craftmaking were identified as key value-chains that could be up-scaled in Uganda. 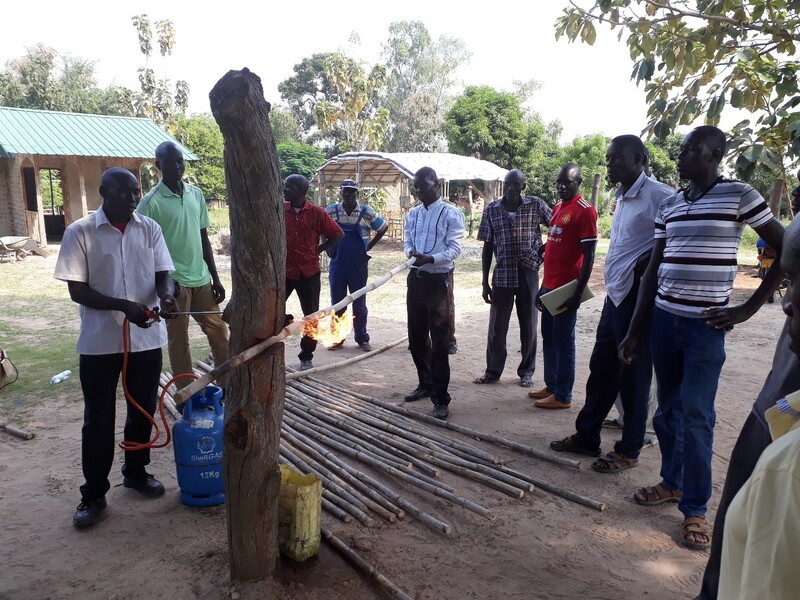 With this is mind, a pair of ‘Training-of-trainers’ (ToT) sessions in bamboo construction, each two weeks long, were conducted in Moyo (West Nile region) and in Kampala (Central Uganda) respectively, led by master trainers who travelled from India. 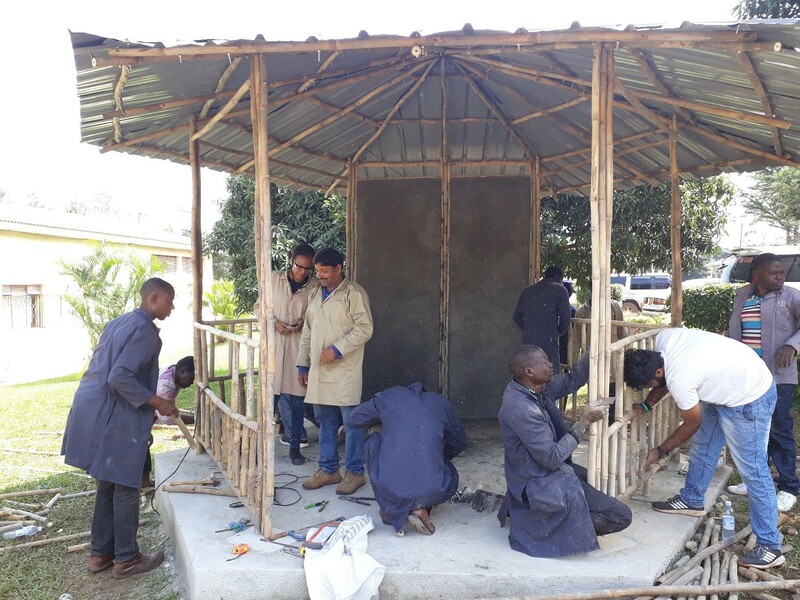 The trainees were versed in each key step of the construction process, starting with bamboo selection, preservation and treatment (see above) and moving onto component preparation, ground connectivity, column erection, truss preparation, walling techniques, roofing, finishing and maintenance works. 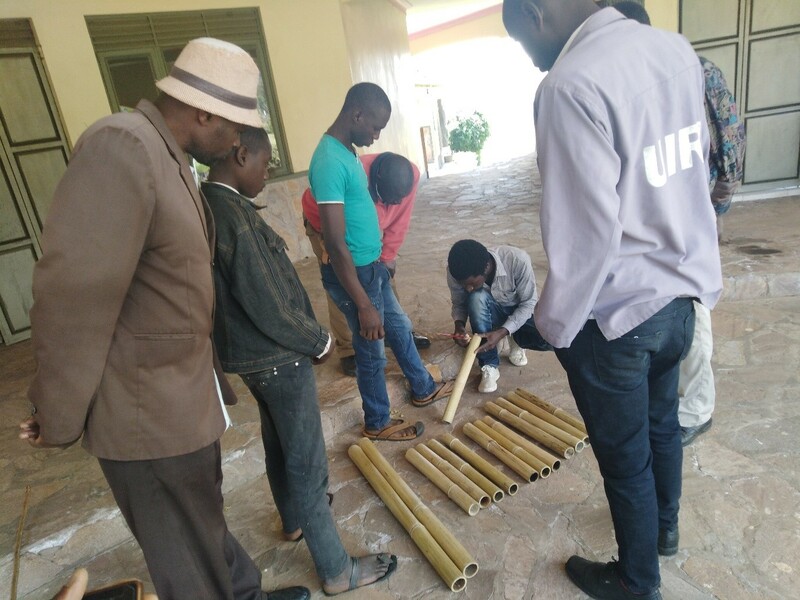 The bamboo construction workshop in Moyo was conducted in collaboration with Friends of Bamboo Ltd and in Kampala, ToT was conducted in collaboration with the Uganda Industrial Research Institute (UIRI). 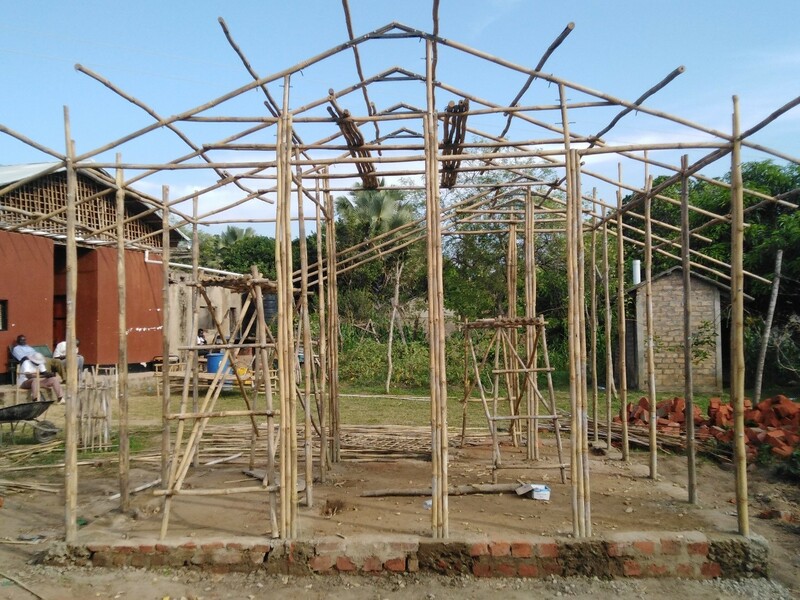 The frame of the bamboo house constructed as part of the Construction training programme. 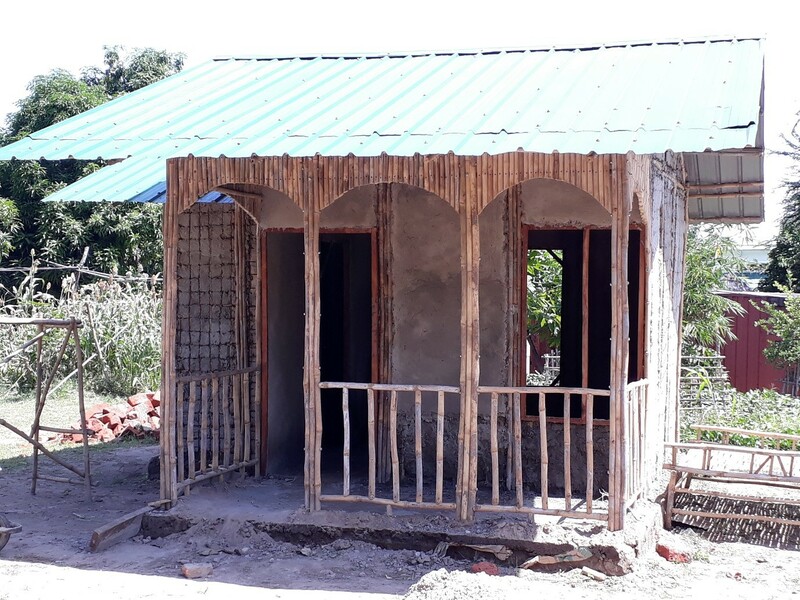 A total of 22 participants attended the training in Moyo, and the session culminated with the construction of a house, comprising a bedroom, toilet, kitchen and verandah. This structure was meant as a demonstration model for low cost construction from bamboo in the West Nile region of Uganda. Eng. Fred Ijjo, a workshop participant, told INBAR that his training has provided a lot of new insights into using bamboo in construction. 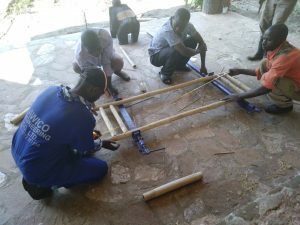 In Kampala, at the site of the second bamboo construction workshop, a demonstration bamboo gazebo was constructed during the training. Workshop participants work on the bamboo gazebo made as part of the construction workshops. This activity was conducted in collaboration with UIRI. A total of 20 participants from UIRI, the Uganda Bamboo Association, Tree Trends as well as private entrepreneurs and architects attended. Mr. Ombala Sunday, a research technician from UIRI commented that the training had enabled him to learn a lot of new techniques in bamboo construction. “Now we will add to these skills by practicing by ourselves and continue to learn and teach from here”. Elsewhere, INBAR’s training sessions covered bamboo furniture and crafts. This time outside help arrived in the form of master trainers from both Tanzania and India. 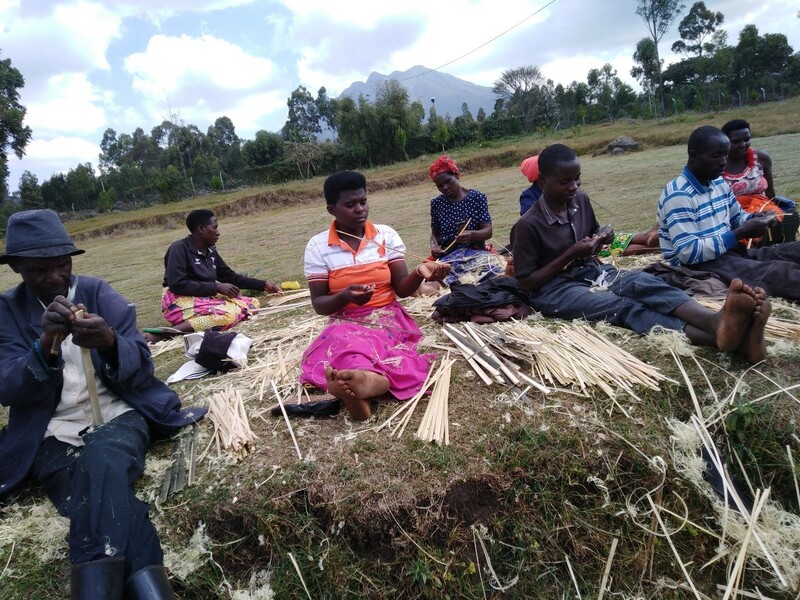 The trainers from Tanzania conducted two workshops each on bamboo furniture and craftsmaking, using highland bamboo, in Mgahinga and in Manafwa respectively – both located in the Mount Elgon region of Uganda. A total of 56 craftsmen attended the crafts training program, where many kinds of products were made, from lamp shades to shopping baskets. 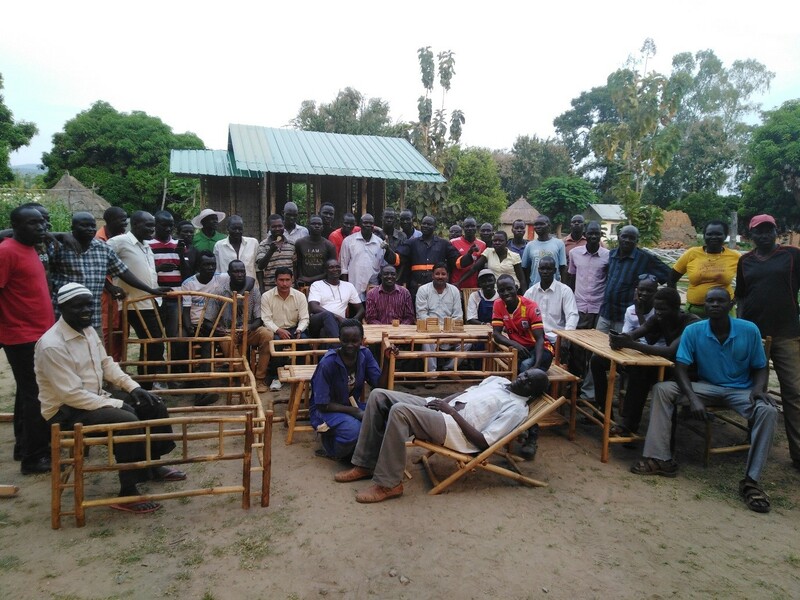 In the furniture training, products such as chairs, sofa sets, and even beds were introduced to the participants. 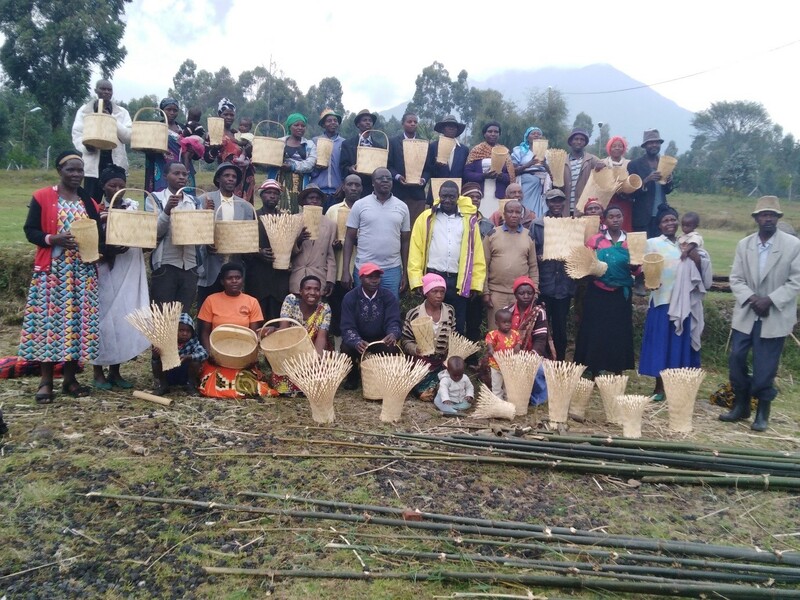 This training was conducted in collaboration with Mgahinga Craft Centre in Mgahinga (Kisoro); and with the District Commercial Office in Namisindwa. 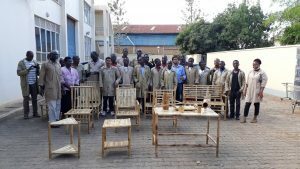 Master trainers from India conducted training focussed on lowland bamboo, since the bamboo used for furniture production in India is similar to the lowland bamboo found in Uganda. This training mirrored the construction events, taking place over two-week periods (2 weeks training) in Moyo and Kampala Training in Moyo was conducted in collaboration with Friends of Bamboo Ltd and total of 24 for furniture artisans attended the training program – see below two pictures- and eleven new product designs and technologies were introduced. In Kampala the training was conducted in collaboration with Uganda Industrial Research Institute (UIRI) for 30 participants from UIRI, The National Forestry Resources Research Institute (NAFFORI), Tree Trends, Uganda Bamboo Association (UBA), and private entrepreneurs, among others. The Honourable Flavia Munaaba Nabugere, one of the participants, told INBAR that she is happy that the training benefitted 10 members of UBA to upgrade their rudimentary furniture making skills. 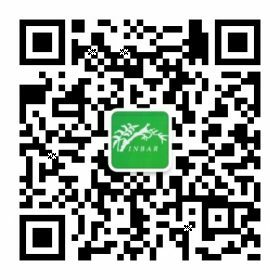 These training workshops are part of INBAR’s wider effort to build individual artisans’ capacity, but also to raise awareness of bamboo’s potential as a desirable, value-added product, and to encourage a scale-up of bamboo plantations in the area. To read more about the Sino-Dutch East Africa Bamboo Development Programme, click here. To read more about INBAR’s work facilitating South-South cooperation, SDG17, click here.